FUNET Railway Photography Archive: Latvia - Gulbene - Aluksne narrow gauge train "Banitis"
Latvia - Gulbene - Aluksne narrow gauge train "Banitis"
Once all the ex-Soviet Baltic states were full of narrow gauge train lines, some of which were extremely long. 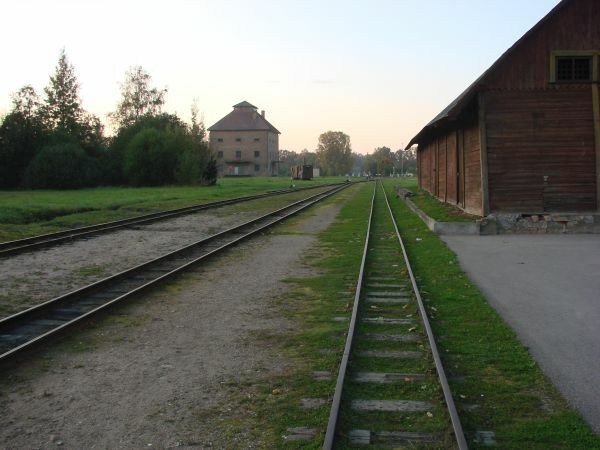 One of the few remnants is the 33 km long line in northern Latvia, between the towns of Gulbene and Aluksne. Also this line has a strong touristic look and feel today, but it is still also used as a day to day passenger traffic means between the two towns. Click on the picture to see the map is larger scale. The train line is operated by "SIA Gulbenes - Aluksnes Banitis". It takes half an hour for the small train to run the 33 km track end to end and during normal weekdays there are four back and forth train pairs in operation. There are nine stops underway. There is a lot more information at www.banitis.lv/eng Picture from Gulbene 25.9.2008 by Ilkka Siissalo. 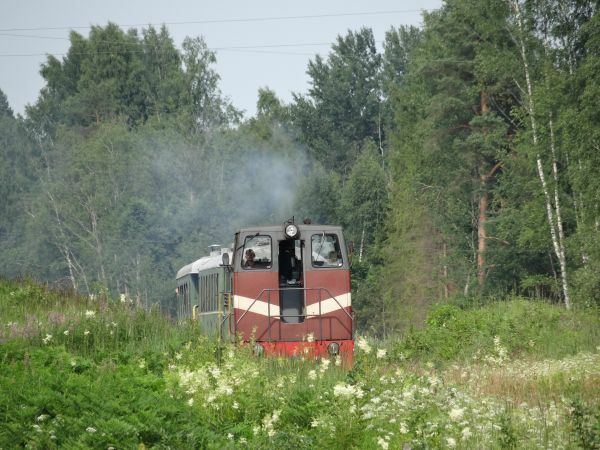 Today it is fairly rare to see one of the old TU2 class diesel engines in use at the Gulbene-Aluksne small railroad, but here the photographer had good luck. 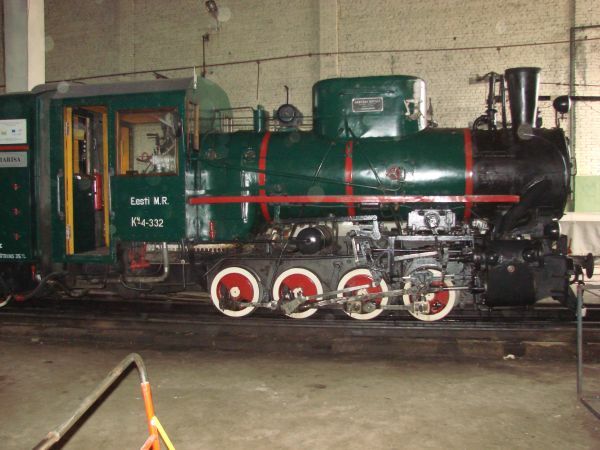 These were the first diesel locomotives after the steam era on the Baltic narrow gauge lines. The first TU2 machines rolled out of the Kaluga factory in USSR in 1955. 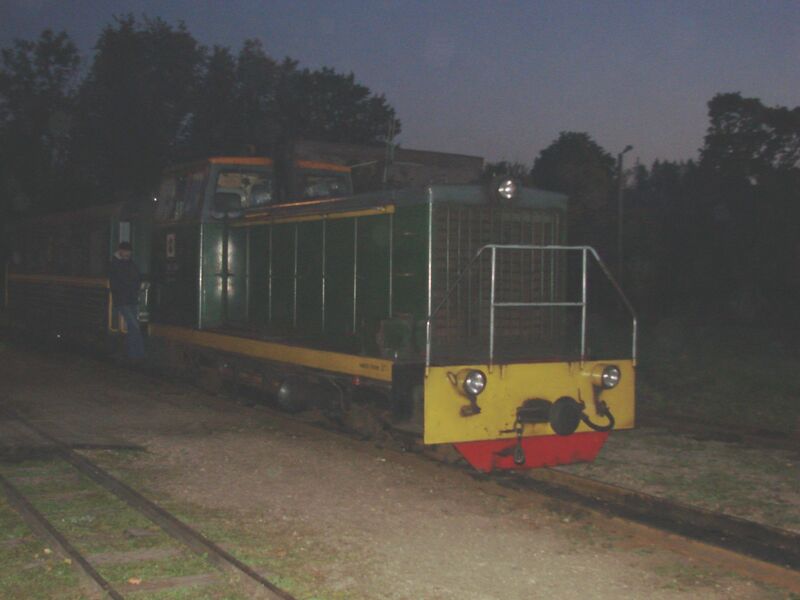 It is a diesel electric machine with a 300 hp engine. Top speed in theory is around 75 km/h, but the condition of the tracks normally only allows around 50 km/h. 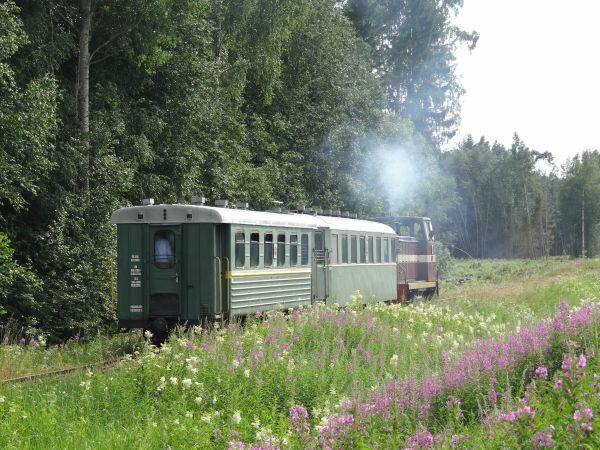 Picture of a TU2 and one coach arriving at Aluksne station 23.7.2014 by Kyösti Isosaari. 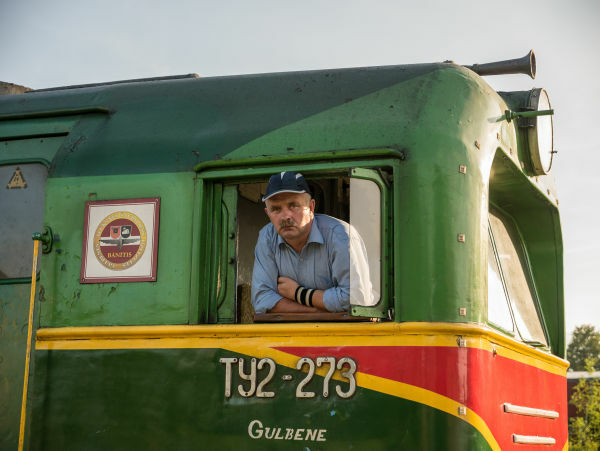 TU2 and its driver. Picture 23.7.2014 in Aluksne by Kyösti Isosaari. 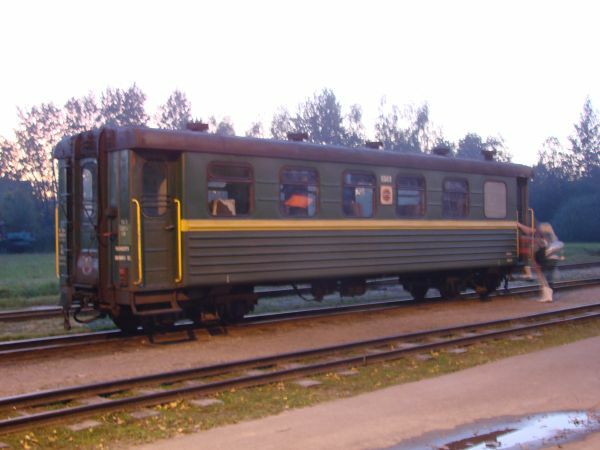 TU2 and its one coach train at the Gulbene station. Picture 23.7.2014 in Gulbene by Kyösti Isosaari. 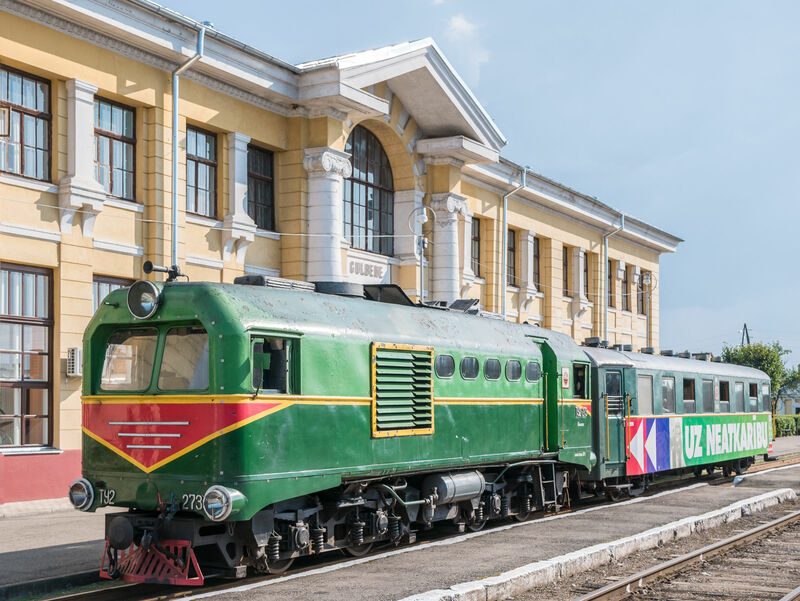 TU2 and its one coach train arrives at Aluksne station. Picture 23.7.2014 in Aluksne by Kyösti Isosaari. 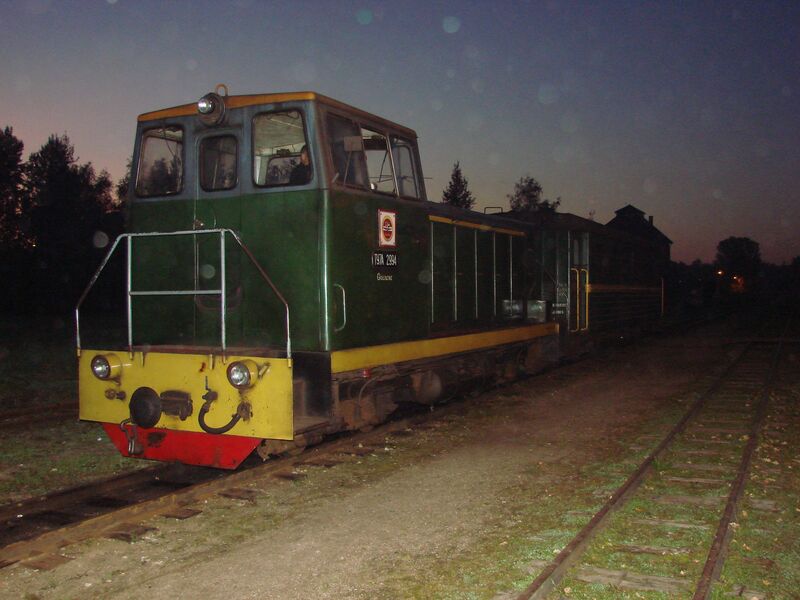 It was already dark when the last train of the day arrived from Gulbene to Aluksne on 24.9.2008. As usual, the train consisted of only the locomotive, a TU7A from the year 1988 and just one small coach. Picture 24.9.2008 by Ilkka Siissalo. Only one passenger wanted to travel from Aluksne to Gulbene on the last train of the day of 24.9.2008. Here she is climbing onboard while the small locomotive is driving around the only coach to be connected at the front end of the little train. No, it is not low-floor ! Picture in Aluksne 24.9.2008 by Ilkka Siissalo. The little train is ready to go. The locomotive TU7A no.2994 was built by Kambarka Machine building Factory, USSR (Russia) in 1988. We heard from the maintenance crew in Gulbene that they have had a lot of difficulties to get spare parts for these Soviet machines, although they were once very common and they are not old. Picture in Aluksne 24.9.2008 by Ilkka Siissalo. 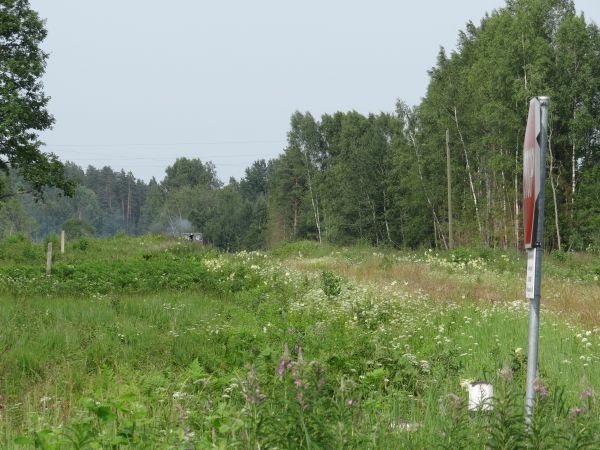 There are nine stops along the 33 km long line between Aluksne and Gulbene. The small train rolls through fields and forests in a beautiful countryside. Here a young lady is waiting for the train to get to the town of Gulbene. Picture at the train stop Birze 26.6.2013 by Ilkka Siissalo. ...and here the train is already approaching... Picture at the train stop Birze 26.6.2013 by Ilkka Siissalo. ...Wow ! It's a long one today. Two coaches ! 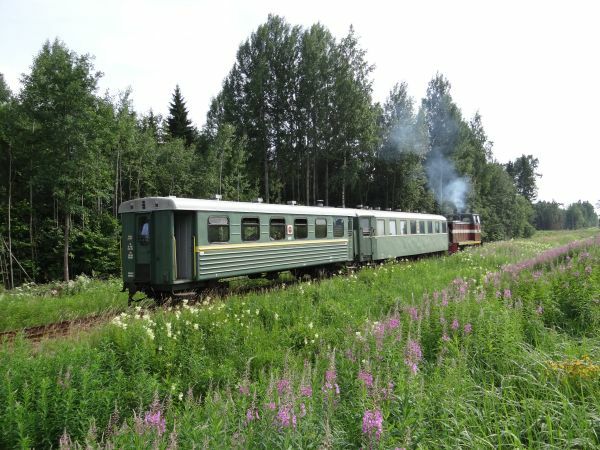 :-) Picture at the train stop Birze 26.6.2013 by Ilkka Siissalo. ...Now it's stopping and our young lady is getting ready to hop onboard the first coach, a 1960 model Polish Pafawag. Picture at the train stop Birze 26.6.2013 by Ilkka Siissalo. The locomotive on this day was again a Russian TU7A from the 1980s. 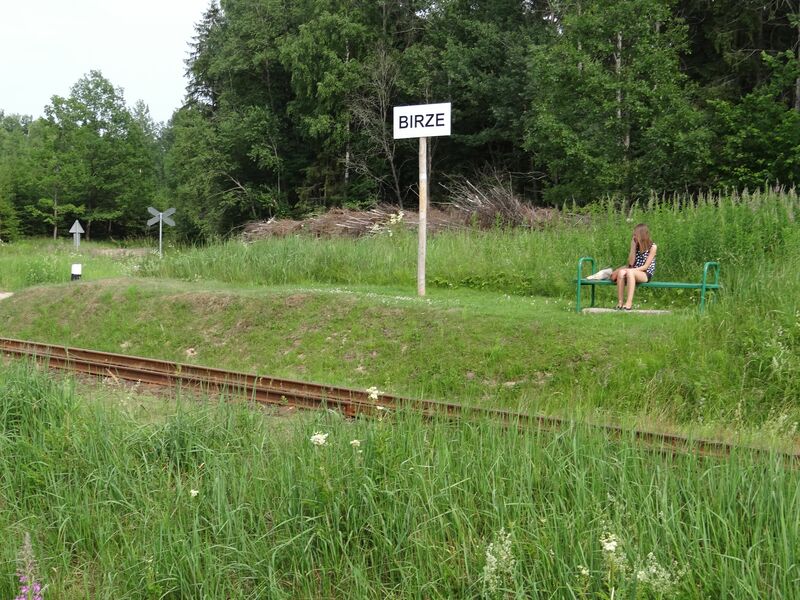 Picture at the train stop Birze 26.6.2013 by Ilkka Siissalo. More than enough space for the less than 10 passengers. It would seem that our young lady is the only passenger in the larger first coach. 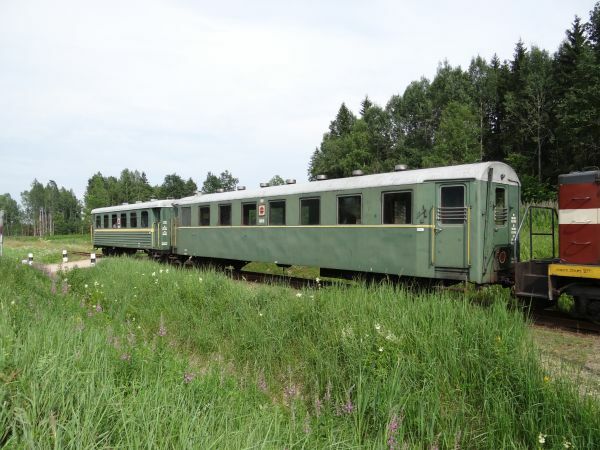 Maybe the Russian smaller coach was more popular on a hot summer day, because on those coaches one can at least open the windows, whereas in the Polish ones you can't. Picture at the train stop Birze 26.6.2013 by Ilkka Siissalo. We heard later during the same day that this TU7A which was on duty had a quite worn out engine and it could easily consume over 30 liters of motor oil during a day. No wonder it seemed a bit smokey. Picture at the train stop Birze 26.6.2013 by Ilkka Siissalo. ...especially the accelerations caused a lot of oil smoke. Picture at the train stop Birze 26.6.2013 by Ilkka Siissalo. Cargo traffic on the small "Banitis" (little train) is just a memory now. 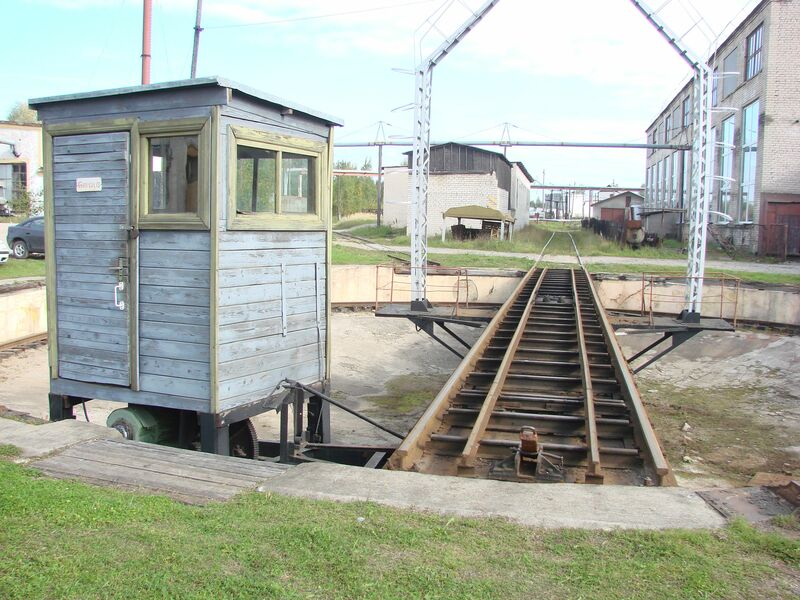 An old cargo wagon at Aluksne station. Picture 24.9.2008 by Ilkka Siissalo. Two of the passenger coaches used by the small "Banitis". The smaller one on the left is from Soviet Russia, built by Demihova machine building factory in Russia in the 1980s. 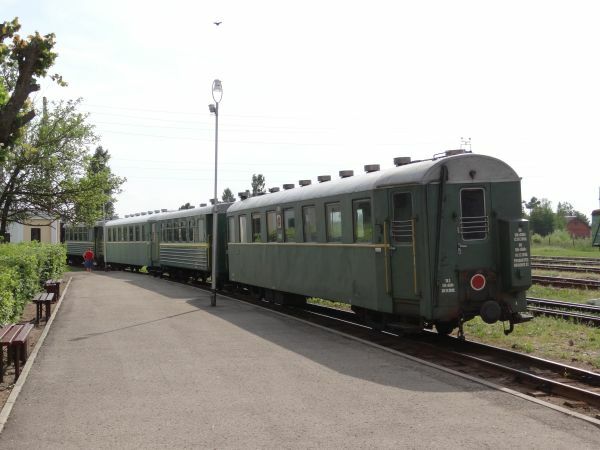 The bigger coach on the right is from Poland and it has been built by Pafawag in 1960. Picture 25.9.2008 in Gulbene by Ilkka Siissalo. A couple of times per year there are train festival days and by then more coaches are needed. There's enough space for a big crowd when needed. Picture 26.6.2013 in Gulbene by Ilkka Siissalo. A view from Aluksne station. 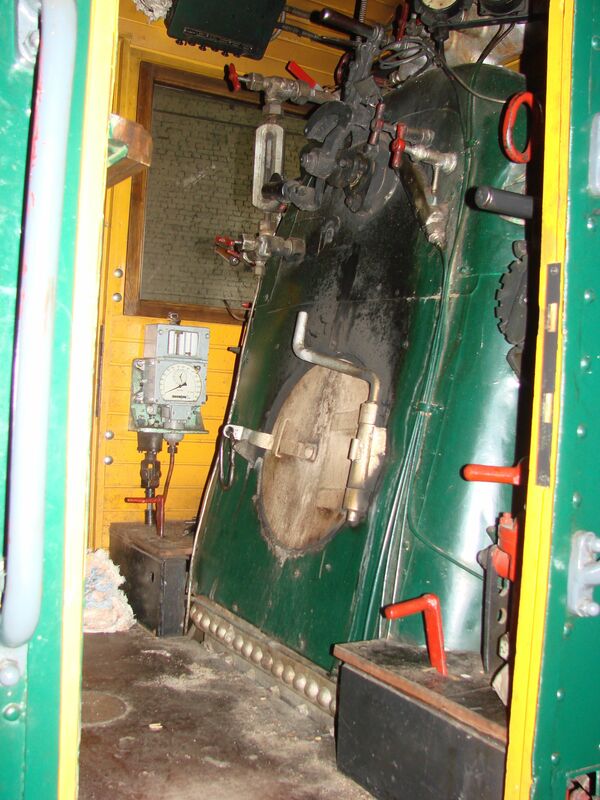 The line gauge is only 750 mm, so it looks extremely narrow. 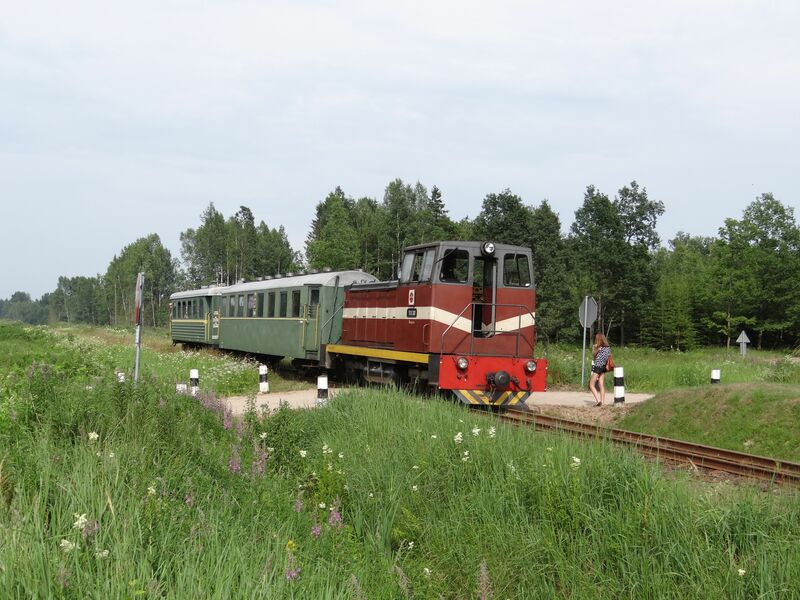 Originally in the 1800s the line was narrow gauge all the way from Stukmani in south to Valga in the north by the Estonian border, but the Stukmani-Gulbene section was rebuilt to broad gauge by the Russians. Traffic north of Aluksne ended in the 1970s. Picture 24.9.2008 by Ilkka Siissalo. Gulbene station in 2008 after renovations. 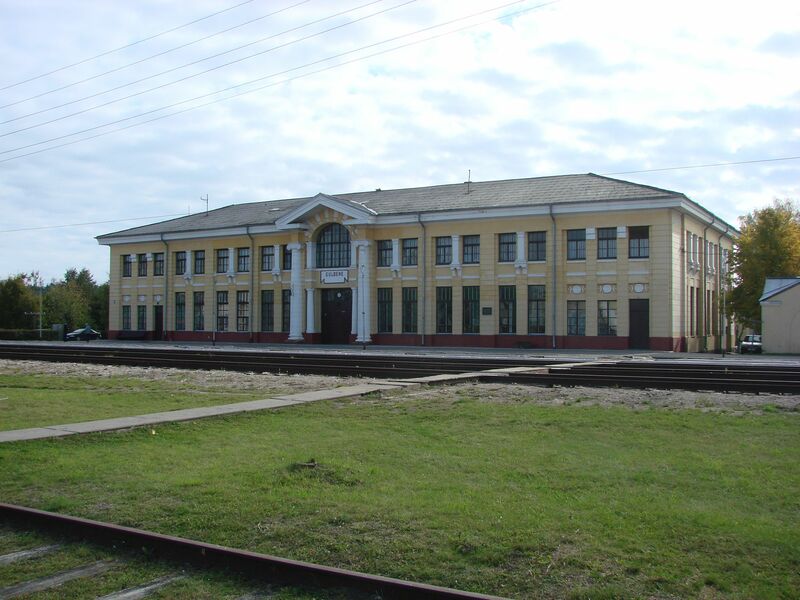 Gulbene used to be an important station with a large train reparation workshop during the Soviet times. 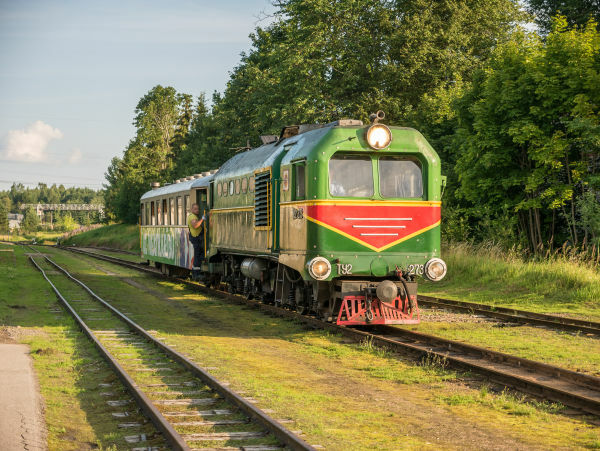 When this picture was taken, there was still one daily diesel train pair running between Gulbene and the capital Riga, but nowadays even that is cancelled and the only user of this huge station is the small one coach Banitis. Picture in Gulbene 25.9.2008 by Ilkka Siissalo. There are still some narrow gauge cargo wagons left at the Gulbene train workshops and some of them are still fairly modern. 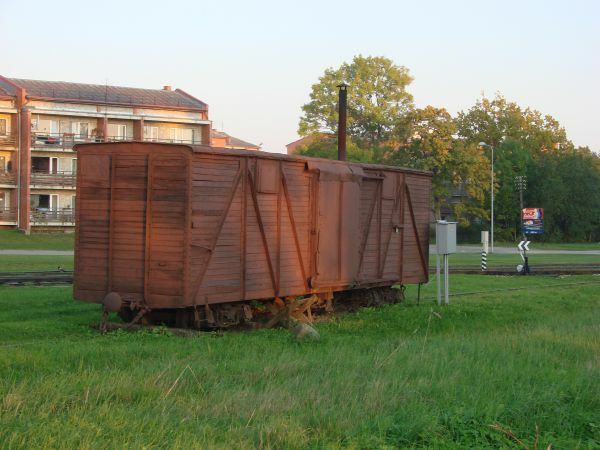 This type of flat wagons were used by the Soviet army to carry tanks. Picture in Gulbene 25.9.2008 by Ilkka Siissalo. An old narrow gauge oil wagon. Picture in Gulbene 25.9.2008 by Ilkka Siissalo. 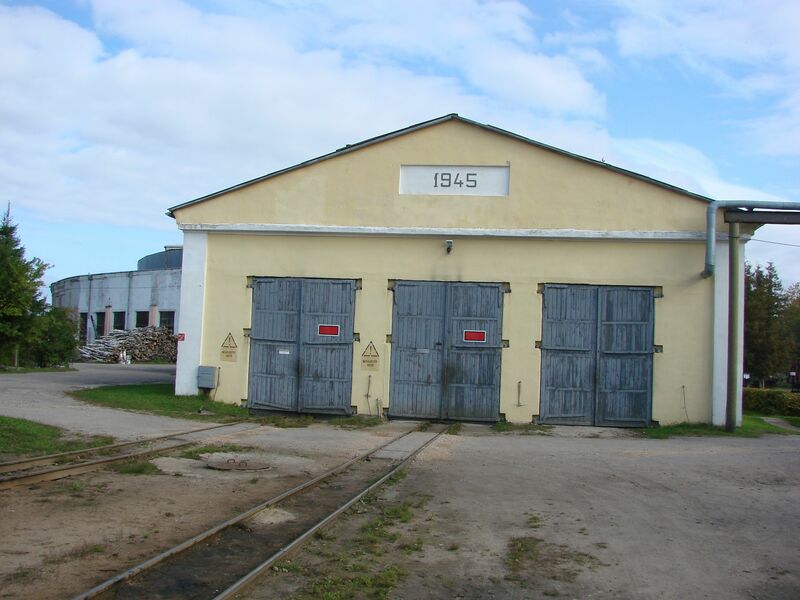 The Soviet Russians built in Gulbene right after the second world war not only a huge station, but also large repair shops for both narrow gauge and broad gauge locomotives and wagons. Picture in Gulbene 25.9.2008 by Ilkka Siissalo. 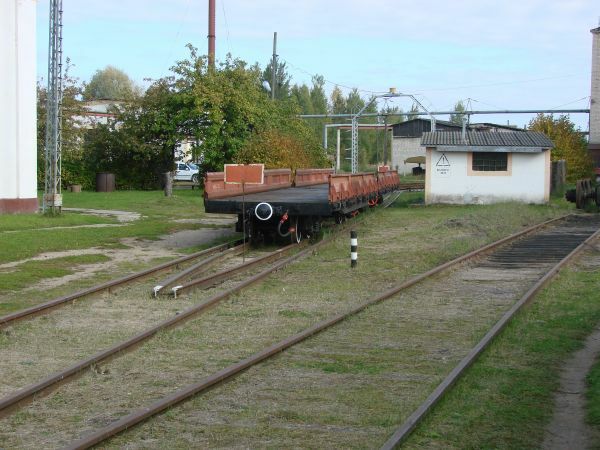 The turntable for the Gulbene repair shops was intended for turning not only broad gauge but also narrow gauge locomotives. Picture in Gulbene 25.9.2008 by Ilkka Siissalo. This is the type of locomotives that were used also at the Gulbene-Aluksne route after world war II. This is an originally Russian type, developed by the Russian Kolomensk factory. But after the war Russians forced many other countries also to produce these same locomotives and deliver them free of charge as war reparation payments to the USSR. 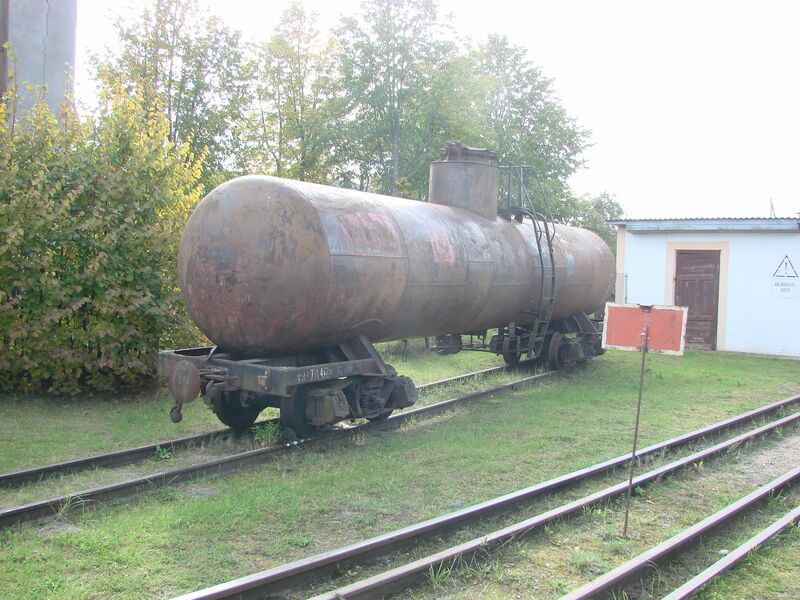 These were produced in Russia (their class VP), Czechoslovakia (class KCh), Finland (class PT4), Poland (class Kp4) and Hungary (class Kv4) in 420 copies, which operated not only in the USSR, but also in Poland and China. 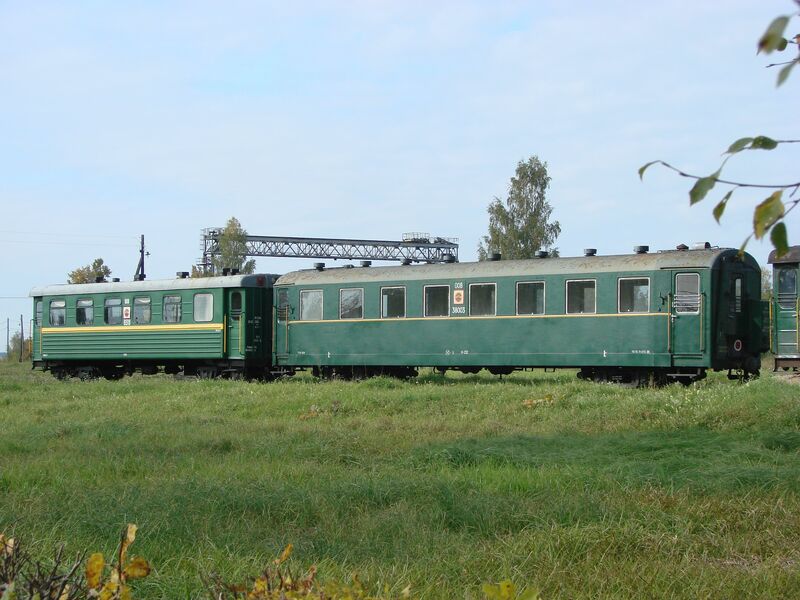 This example in Estonian register was built by Škoda in Czechoslovakia as class KCh, but it has a tender built by Tampella in Finland. This was an Estonian museum locomotive which was just receiving skillful service in Gulbene at the time of my visit in 2008. The machines weighed 16 tons and their maximum speed was 35 km/h on 750 mm tracks. Picture in Gulbene 25.9.2008 by Ilkka Siissalo. The same class KCh locomotive as above. This was the drivers' workplace. Picture in Gulbene 25.9.2008 by Ilkka Siissalo. 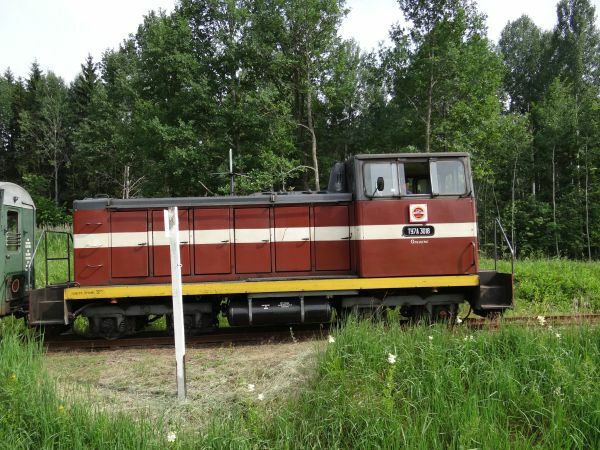 This is a pre-war German narrow gauge locomotive of the German DRG class 99, taken by the Russians from Eastern Germany. 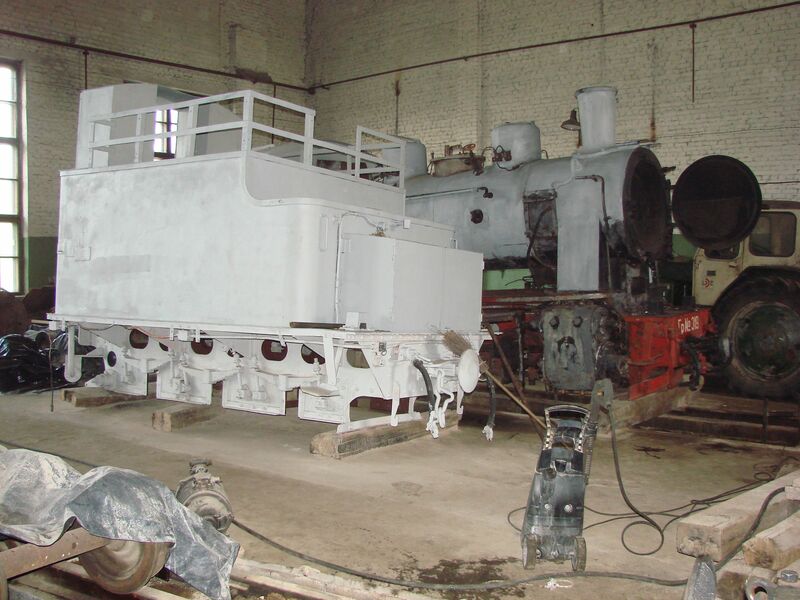 It was renamed in the Soviet Union as class Gp and here it is under reparations in the Gulbene workshops in 2008. Picture in Gulbene 25.9.2008 by Ilkka Siissalo.